Kythnos is of particular archaeological interest but many known archaeological sites have not yet been excavated. Maroulas was the oldest prehistoric settlement in the Cyclades. The site dates back to the Mesolithic period (8500-6500 BC). Excavations here have brought to light remains of circular structures that were probably used as living quarters as well as few burials. Kythnos played an important role in the development of early metallurgy. An important site of the Early Cycladic II period (3 millennium BC) was researched at Skouries, the northern coast of the island. The facilities of historical times are enough. There are several towers of circular and rectangular shape of classical times. The fortified acropolis at the northern tip of the island, which is now known as the Castle of Oria, coincides with the capital of the island during the Byzantine and Latin periods but seems to have been inhabited since the prehistoric times. On the contrary, another fortified acropolis on the island, Castellas on the SW coast, seems to have been founded in early historical times but was abandoned at the end of the Archaic period. The ancient capital of the island, on its northern coast which was named Kythnos according to the ancient sources is now called Vryokastro. Surface excavations brought to light rich finds along with the understanding of the ancient town planning and settlement of the fortified city, which was inhabited continuously since 10 BC up to 6 AD. 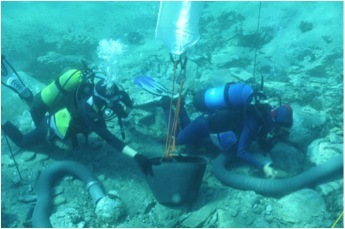 In the underwater excavation of the ancient harbor (Mandraki bay), two marble statues of the Roman period and parts of the coastal fortification wall were discovered. At the top of the acropolis, an important sanctuary devoted to goddess Demeter, holds a dominant position. The sanctuary was in use from the 8th century BC until the 1st century AD. At a lower level, there are two monumental orthogonal structures, probably temples, which can be dated back to the 4th or 3rd century BC. Another sanctuary is located at the northernmost end of the same plateau. The excavations of the University of Thessaly have led to significant discoveries. The finds date from the Archaic to the Hellenistic times. Two solidly built altars were found and right beside them a twin temple, which was probably built in the Early Archaic years (7th century BC). The sanctuary of the temple was unearthed, with numerous votive offerings in place. These are precious jewels and other votive offerings date back to the archaic period. The identity of the worshiped deities remains uncertain, although there are indications that the sanctuary was dedicated to Apollo and Artemis. Both wealth and the varied and exotic origins of the findings lead to a re-examination of the view that Kythnos was a poor island in antiquity. The most important site of historical times is Vryokastro or Rigokastro, as it is today called, according to the ancient sources of Kythnos. The surface excavations from 1990 to 1995 brought to light rich discoveries so urban planning and urban organization of the city were largely understood. As evidenced by the findings, the island was continuously inhabited from the 10th to the 6th-7th century. Among the numerous findings, the most important ones are funerary reliefs, sculptures, architectural elements, inscriptions, fragments of archaic jars with relief decoration, Attic pottery of the Archaic and Classical periods, the stamped handles of commercial amphora etc. Based on surface pottery, the abandonment of the city is placed in the 6th or 7th century AD when the inhabitants moved to the fortified settlement of the Oria Castle. Underwater research and the excavation of the ancient port of Vryokastro at Mandraki Bay, began in 2005 and are still going on. At the bottom of the sea the foundations of the coastal walls were found as well as a breakwater of more than 100 meters long, which set in the South the entrance of the port. The entire port and the buildings that were located both on the coast and under the sea were traced. In 2007, one of them was excavated, probably identified with part of the sunken coastal fortification wall. In 2008 and 2009 the excavation brought to light from the depth of the sea, marble statues of the Roman period, among them a thorax of the 1st century BC. B.C. and three Hermaic columns of the 2nd century AD. At the top of the acropolis, occupying a prominent site, an important sanctuary is placed, which, as the surface finds indicate, was in use from the end of the 8th century BC until the 1st century AD. The remains of at least four buildings and probably an altar can be distinguished. The multitude and the type of findings (clay figurines – women and children – lamps, etc.) as well as inscriptions found in the sanctuary of Demeter in Eleusis lead to the safe conclusion that the sanctuary was dedicated to the worship of Demeter. 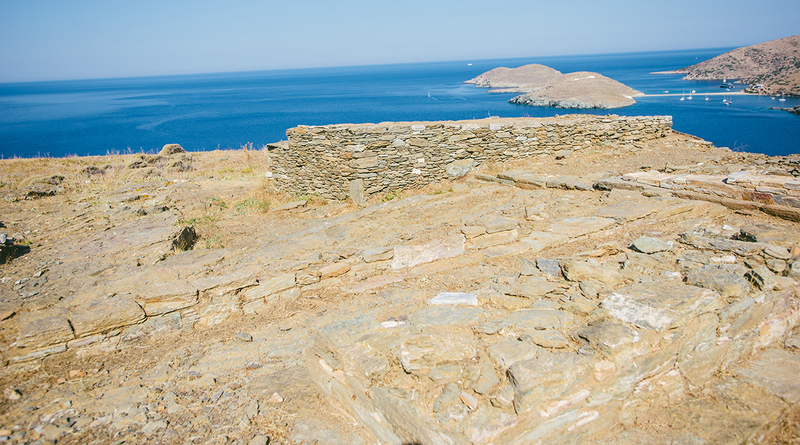 Archaeological finds in the area of Maroulas of Kythnos testify that the island was inhabited during the Mesolithic period (9,000 – 8,000 BC). Several findings from the outdoor settlement used as a replenishment station or a base station are still preserved. The excavations revealed archaeological circular residences, tombs and a human skeleton, near which stone tools were found which were made of firestone, quartz and obsidian. The settlement is the only outdoors one of that period that has been found in Greece.